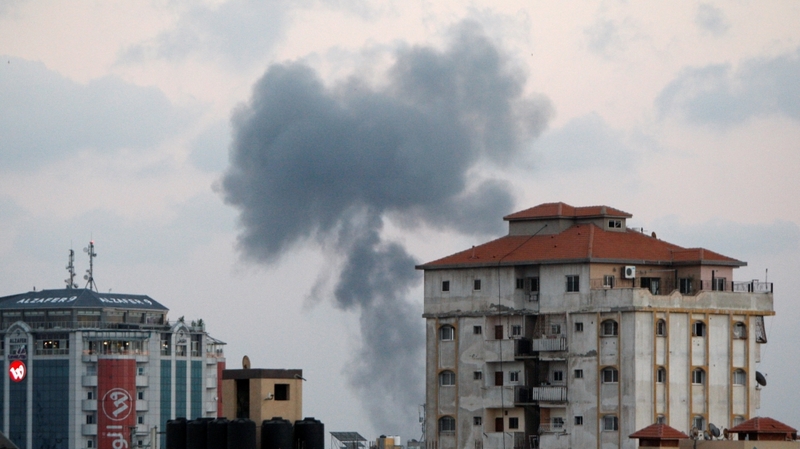 The targets, allegedly belonging to Hamas, were attacked as a result of Friday’s shooting incidents in which at least one Israeli soldier was wounded. Al Jazeera’s Stefanie Dekker, reporting from the protests in Gaza, said tensions were on the rise despite the relatively small crowd that showed up. “We haven’t seen huge numbers of people turn out – yes, there’s been a presence, yes the protest took shape the way we have seen over the past 17 weeks but the crowds were smaller,” Dekker said. “What makes it more tense is there has been an exchange … of fire between Israel and Hamas, and Israel attacked various Hamas posts,” she added. “This all comes amid a very tense political situation. Israel has made it very clear that if Hamas doesn’t stop the incendiary balloons and kites across the fence that it will clamp down heavily militarily. “We haven’t seen any incendiary balloons or kites across the fence where we are, but certainly there is a feeling of unease here – there might be behind-the-scenes negotiations going on, but everyone you speak to will tell you that the situation remains very hard to read, whether there is going to be an escalation between the two sides or not,” Dekker said. “Three Palestinians were martyred by Israeli occupation forces, including two in the northern Gaza Strip and a third in the southern city of Rafah,” ministry spokesman Ashraf al-Qidra said in a statement. Al Jazeera’s Stefanie Dekker, reporting from the protests in Gaza, said tensions were on the rise. “We’ve had a couple of incidents today. We’ve had Israel target three Hamas watchtowers. In the south of Gaza, two Palestinians were killed and one Israeli soldier was injured in what we understand was an exchange of fire in the southern Gaza Strip,” Dekker said. Earlier on Friday, Israel’s Defence Minister Avigdor Liebermann said that there is a risk of military escalation if incendiary kites and balloons continue to be sent over the fence by protesters. “We tried to be sensible and responsible but the heads of Hamas are leading us to a defensive situation, a situation where we would have to go for a wide painful military operation,” Liebermann said.